Ballyliffin Golf Club consists of two outstanding, contrasting links courses and 36 wonderful holes which make up one of the finest golf resorts to be found anywhere in the world. Ballyliffin – The Old Links undulates in the glory of its natural terrain, presenting an immensely enjoyable challenge to every golfer. Work recently undertaken by Nick Faldo, one of Europe’s most successful golfers – with victories at the US Masters at Augusta, The Open and on Ryder Cup Teams, has resulted in an Old Links that has been refined and what is now a fantastic golf course. 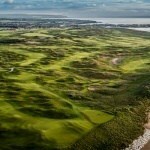 The Old Links hosted the European Seniors Tour in June 2008- The Irish Seniors Open. 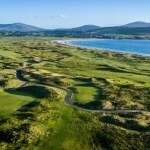 Ballyliffin Golf Club – Glashedy Links is fashioned around the incredible dunes, and is already notorious for its peat riveted bunkers and its opening three challenging par fours. The expansive panoramic views of countryside, coastline and ocean savoured by these magnificent links course will not easily be forgotten. The Glashedy Links has hosted the Irish Inter-provincial Championships in 2006, the European Tour, North West of Ireland Open in 2002 and the Ladies European Tour, Ladies Irish Open in 1998. 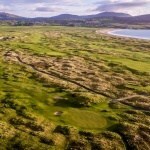 More recently the club has hosted the 2018 Dubai Duty Free Irish Open. This was a magnificent spectacle for Ballyliffin and really showcased what the area has to offer. The home to two championship links courses and one of the warmest welcomes in golf– Ballyliffin Golf Club is a must when putting together an Ireland golf package with your friends. If you would like to play Ballyliffin Golf Club as part of your customized Ireland Golf Trip, please contact us on Ph: +353 (0)91 868642 or Email: sales@northandwestcoastlinks.com . Check out some of our sample packages here.